Jay Leno's days as the Tonight Show host are numbered. 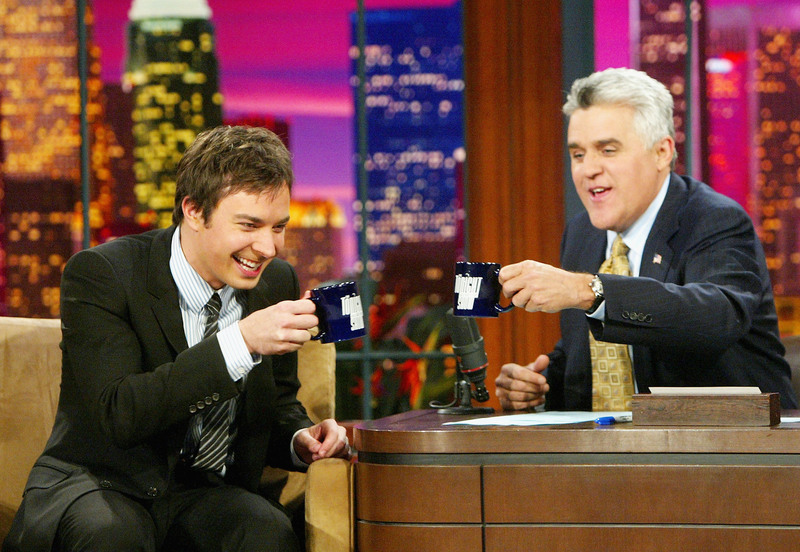 His last day on the show is Thursday, and Jimmy Fallon will be taking over on Feb. 17. Leno’s final show guests are Billy Crystal and Garth Brooks. So, to pass on the reigns, Jay Leno had Jimmy Fallon on the show to haze him and walk down memory lane together on Tuesday. “Jimmy Fallon is here tonight. He’s not here to talk — he’s helping me pack,” Leno says. You know, Jimmy starts as new host of Tonight Show on the 17th — and it would be strange if there was some accident and he was not able to … fulfill his duties as host. Leno showed a clip of his first day on the job two decades ago, and a clip of Fallon's first appearance on The Tonight Show in 2002 when he was 27-years-old, which gave them both ample opportunities to bash each other's outfit. Later on, Fallon did his funny Late Night Thank You Notes segment. In his last one, Fallon thanks Leno for his humor and class in passing on the Tonight Show tradition and says with a straight face, "I will do my best to make you proud every single night."